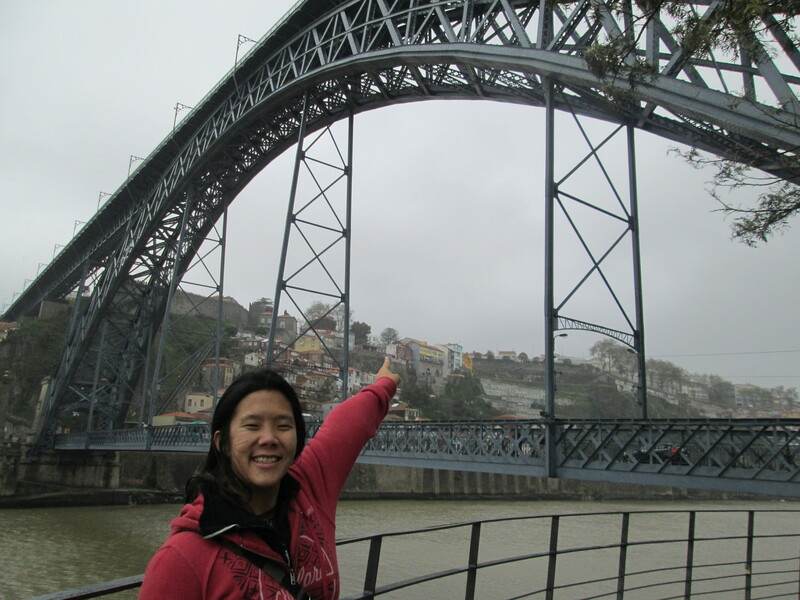 Oporto, is one of the oldest european centers known. It originated many centuries ago as an outpost of the Roman Empire, Today, it is best known for it’s port wine. When wine first emerged in Oporto, there was no method to ensure the quality of wine, as a result the flavor suffered at the hands of the english. The Marquis of Pombal counteracted this by demarcating the region to ensure the wine’s quality and set a standard for production. It was the first attempt within europe to control wine quality and production. 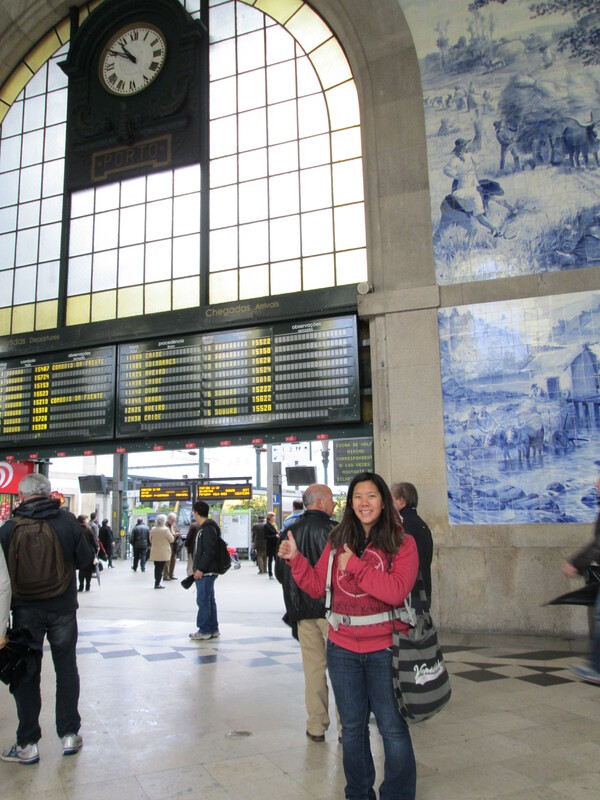 On the way to one of the wine caves, we stopped by to visit the Sao Bento Railway Station. 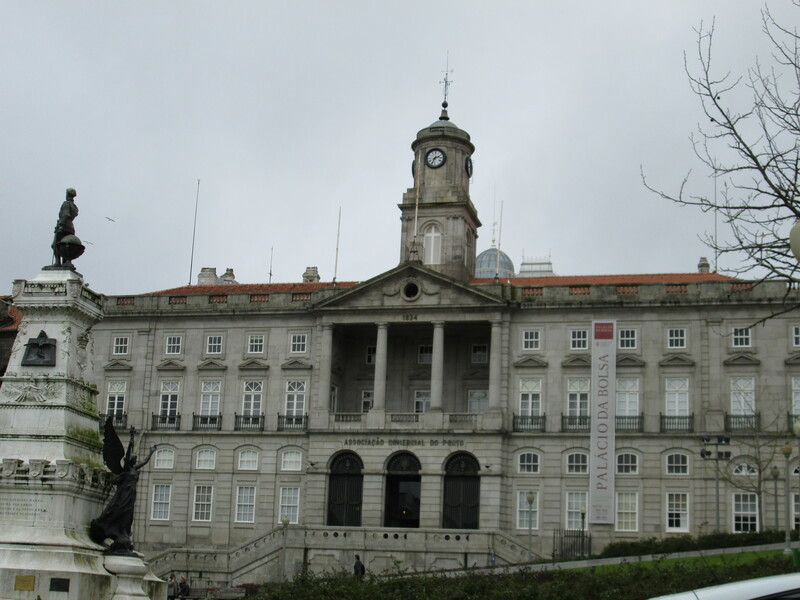 It was inaugurated in 1916 and is best known for its azulejo walls that depict moments in portuguese history. They are the work of Jorge Colaço and date from 1905 to 1916. The building itself is French Beaux-Arts architecture, which uses elements such as conservative sculptural decoration, noble spaces, and symmetry. 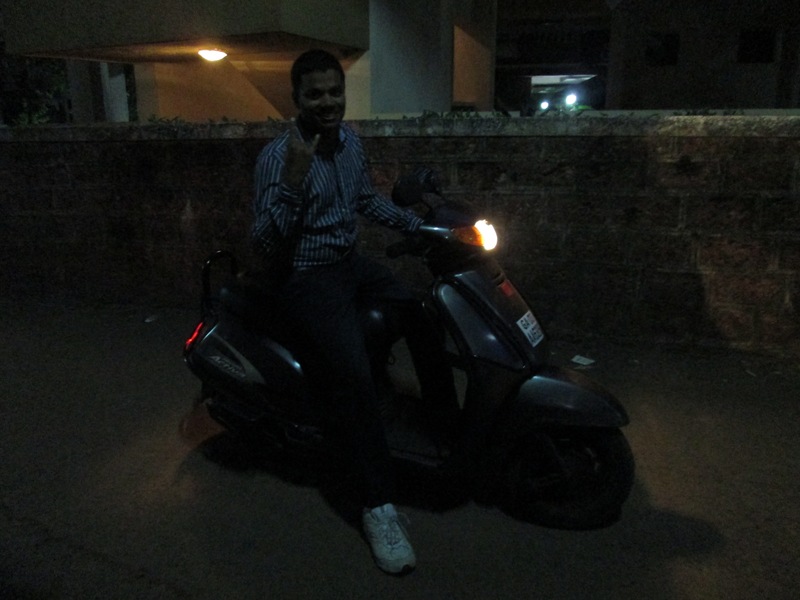 It is still in regular use today. 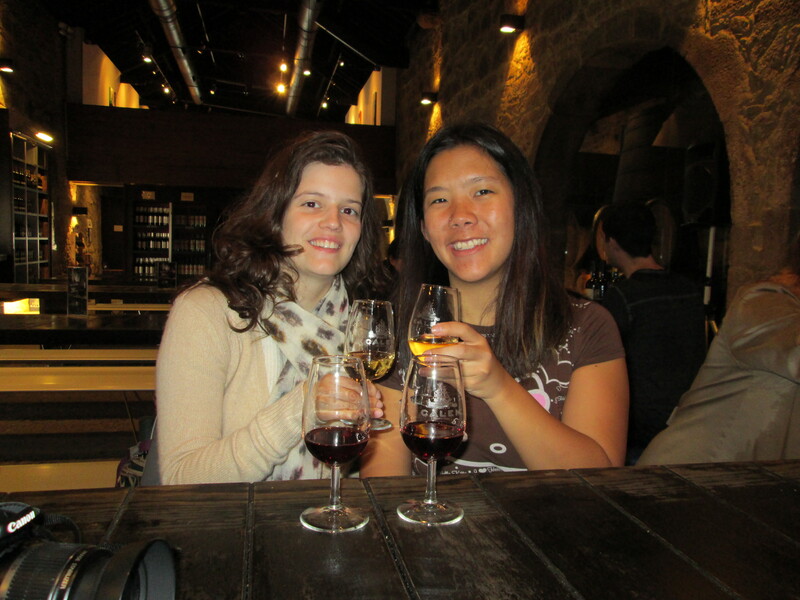 We then stopped by the Calem Winery to savor some Port in Oporto! On our way to the last stop, we paused to enjoy a view of the Casa do Infante, a 14th century house, in which Prince Henry the Navigator was born in 1394. We also passed by the Palacio Da Bolsa, an old stock exchange built-in the 19th century. 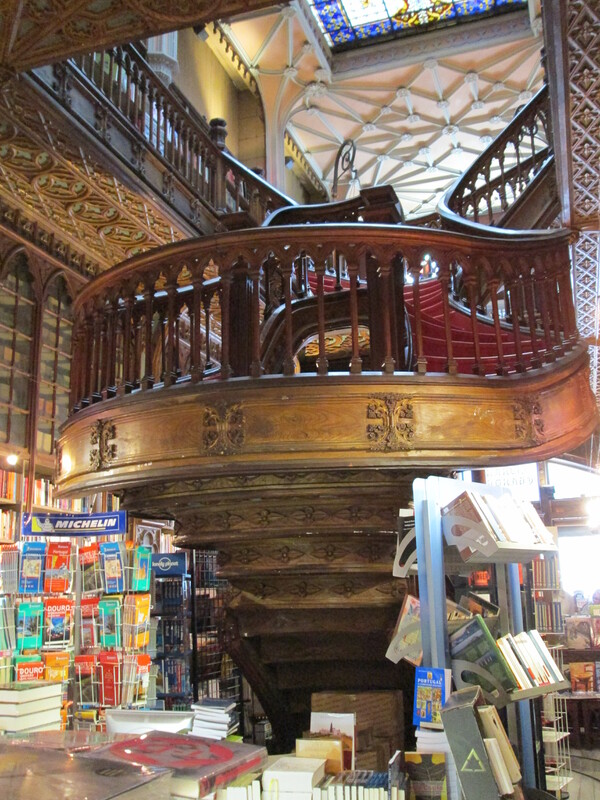 Our final destination was to admire the staircase of the Lello & Irmão bookshop. 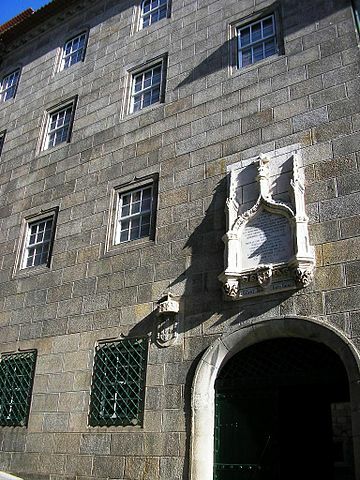 It is speculated that inspiration for the staircases and caped uniforms of J.K. Rowling’s Harry Potter novels stemmed from her time living in Oporto, Portugal. The art-nouveau of the staircase and the bookstore do indeed give me a sense that I stepped into the world of Hogwarts, but it can also be seen as a Self-Fulfilling Prophecy. However, there is no denying the similarities between the Hogwarts uniforms as depicted in the movies, and the traditional school dress for university students. Once again, woke up late, this is becoming a pretty nasty habit since I, as a traveler, obviously want to jam-pack my days with the culture and heritage of the region. 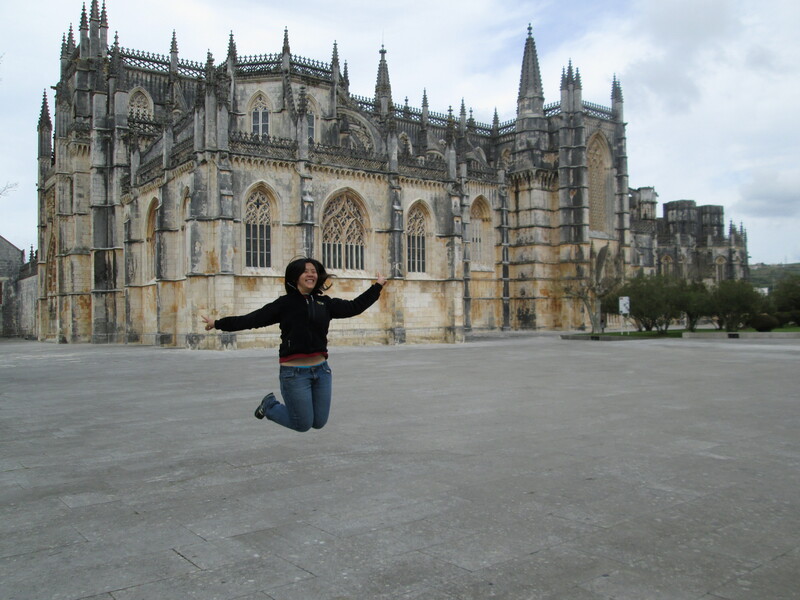 😦 Nonetheless, it was relaxing to take a leisurely day to explore a nearby town, hike up to a castle, and just breathe in the atmosphere of Portugal as I reach my final days in this nation. We didn’t really get a good head-start until around 3 PM this afternoon, despite the fact that I woke up earlier than I have any other day this week (excluding the day trip to Sintra since travel time was a much larger consideration). My friend has just as much affection for sleep as I do. Zzzzzzzzz!! However, my aunt would argue the following “You are on vacation. You aren’t allowed to wear a watch, you are just supposed to relax and care about nothing.” This statute would be much easier to follow if we tourists did not have to conform our schedules around attraction hours. 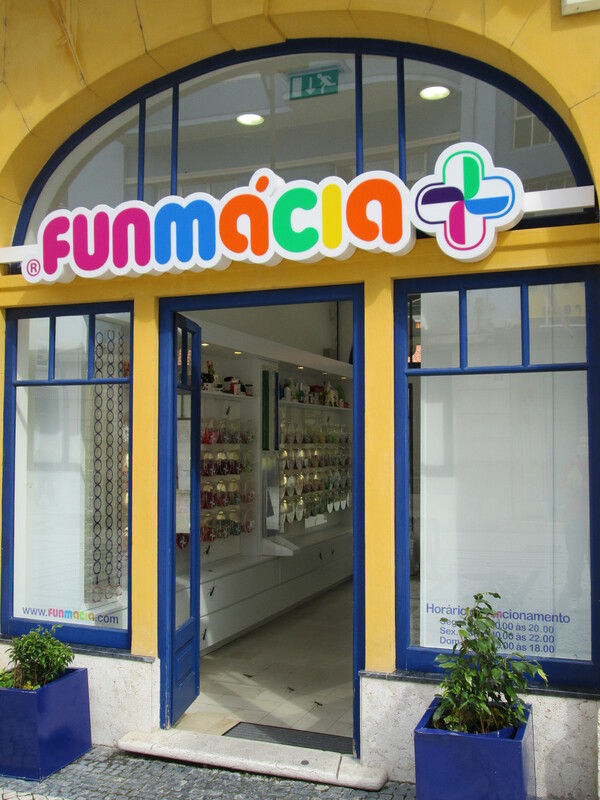 We started off by stopping at the “Funmarcia” an interesting twist on the classic Candy Store.You select your pill container stock it with an assortment of candy, and are written a prescription for it! ‘Medicines’ can range from being antidotes to lovesick woes, stimulators to improve your sense of humor, or Activators to increase your memory (all in jest of course). It was pretty comic to see all the prescription tag-lines the franchise had come up with; definitely not an innovation yet seen in the states. I almost want to open up a franchise myself! Of course, parents would hate how excited their children get over it. 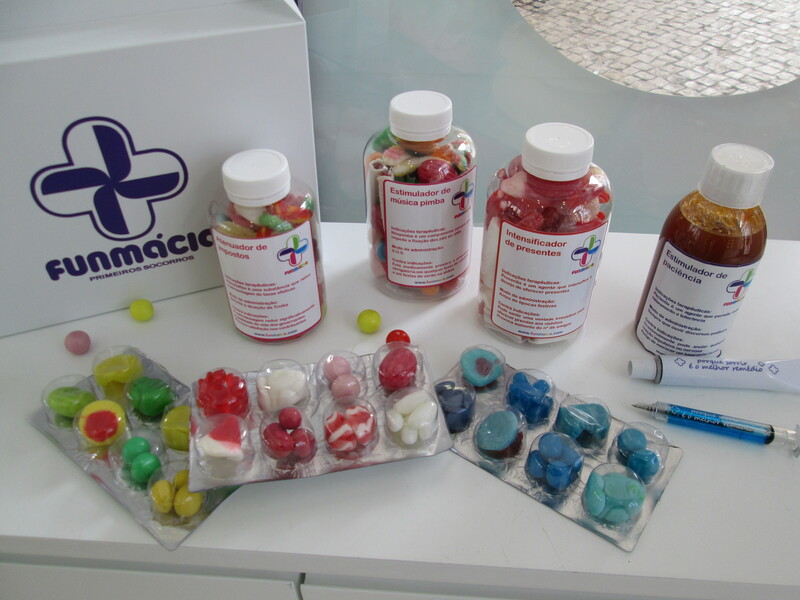 The company is trying to transition to include english prescriptions at this moment. 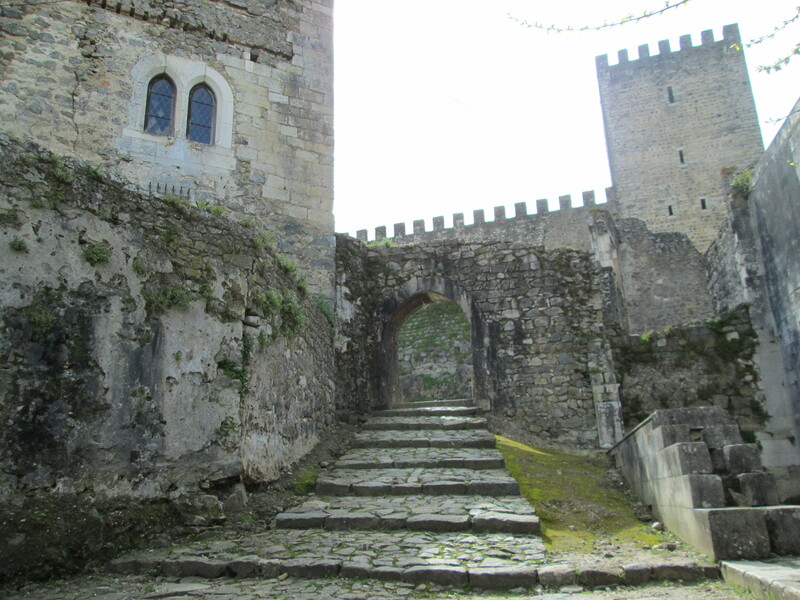 All this candy provided energy for our short, but steep hike up from old Leira to the Leiria Castle. 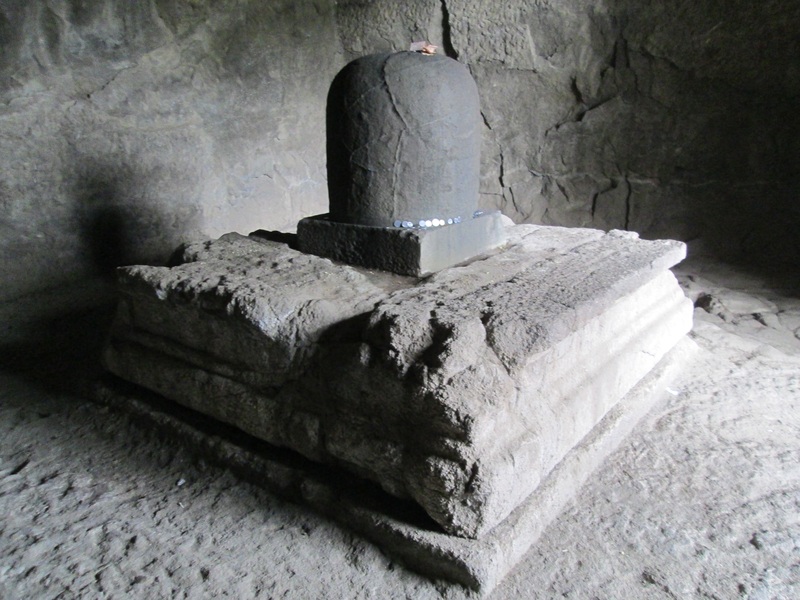 It’s location atop the mountain was strategic since it provided military support to the region. The town itself was founded by D. Afonso Henriques circa 1135. It was a prosperous economical trade center which marketws major products such as olive oil, wheat, wine and timber, as well as ore, and handicrafts. 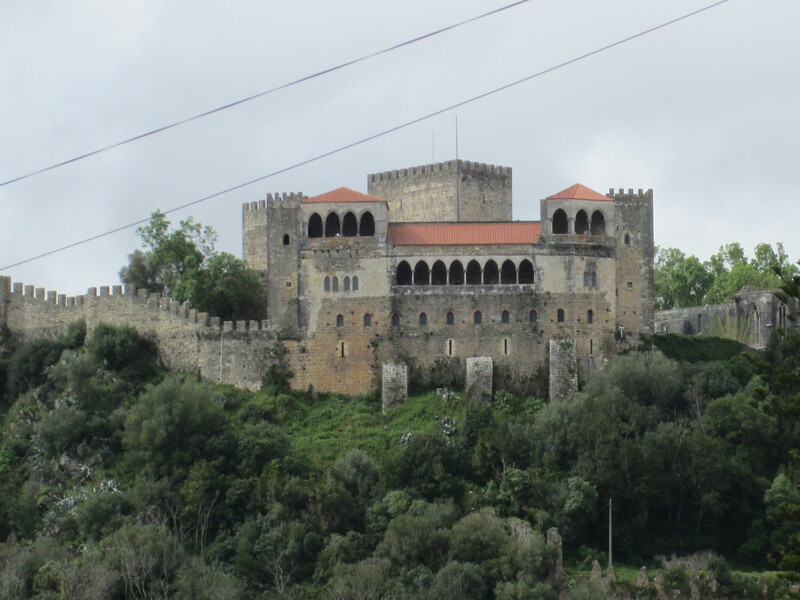 It is believed that Leiria is the first known Portuguese town to produce paper (1411). Despite its origins, which included both Moorish and Jewish districts in the town around the year 1211, it was ultimately chosen by Pope Paul III as headquarters for the Bishop in 1547. The city itself holds a large medley of monuments from the 16th century, the landscape served as a backdrop to a large array of convents. 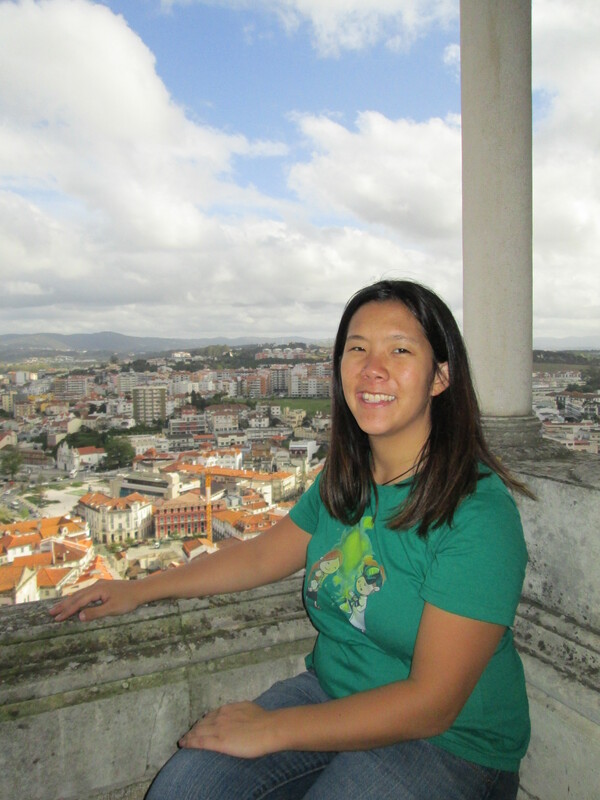 The original plan was to drive to the gorgeous beach town of Nazare, but Portugal’s weather has been uncooperative as of late, and the gloomy sky ended up not boding well for us. 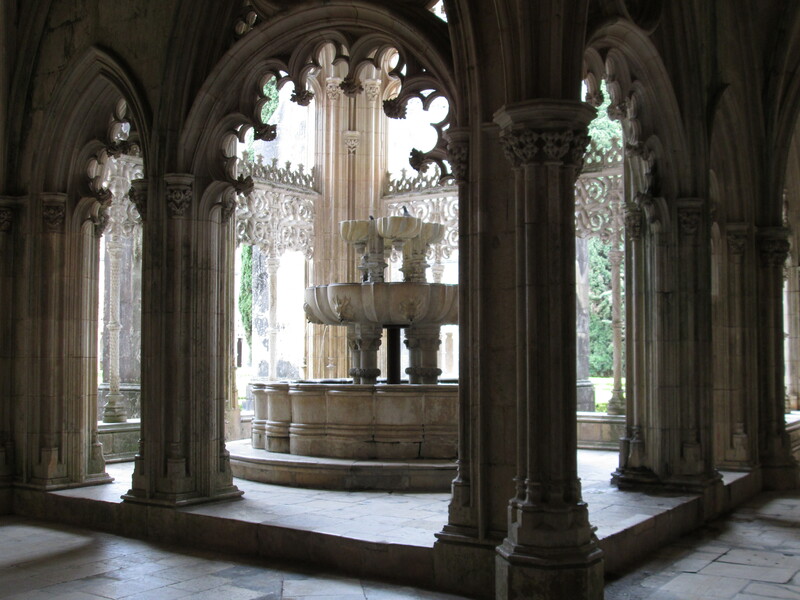 As we continued our day, we went to visit the famed Battle Monastary (Mosteiro Batalha), so named due to a vow given to the Virgin Mary, that should the outcome of a dire-looking battle be victorious, the king would erect a monastery devoted to her. Today, we know this battle as the 1385 Battle of Aljubarrota and the ruler as King John I of Portugal who won a Portuguese victory over the Castilians. 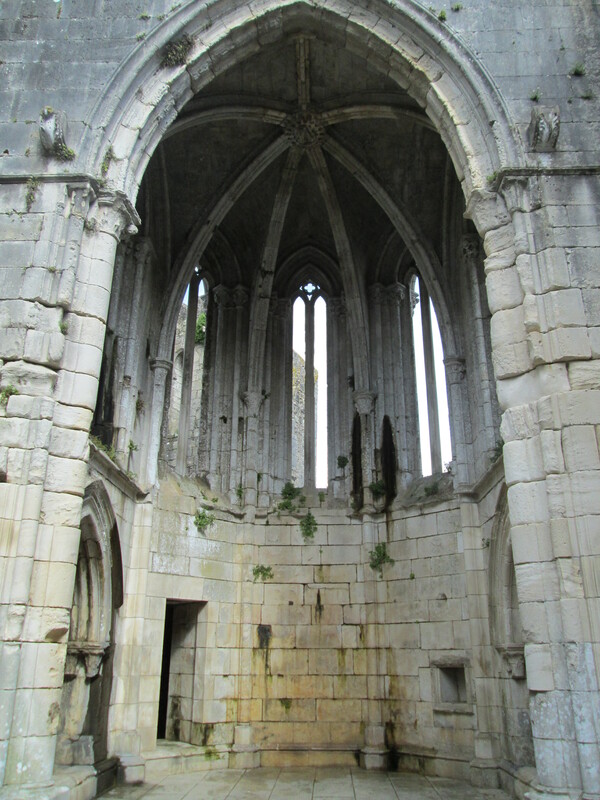 The monastery itself, took over a century to build and was continuously in construct during the reign of seven kings. 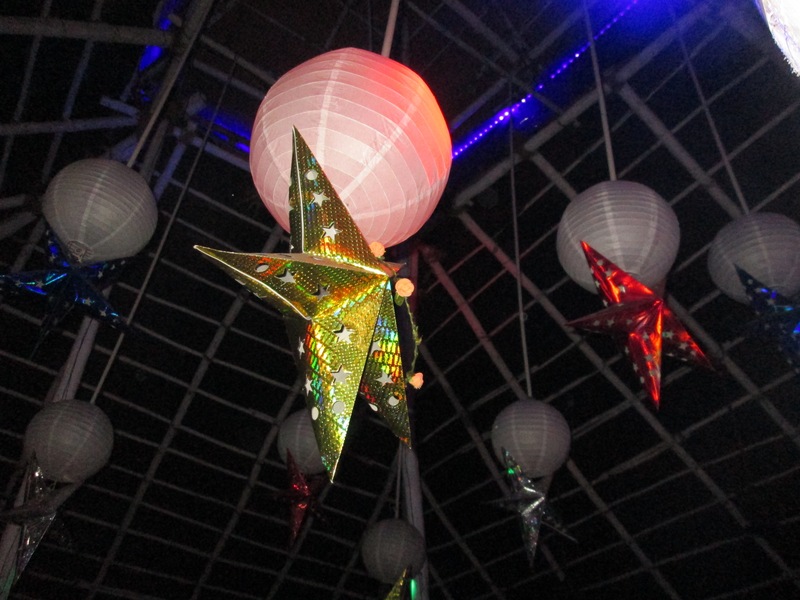 Officially, fifteen architects participated in its design. 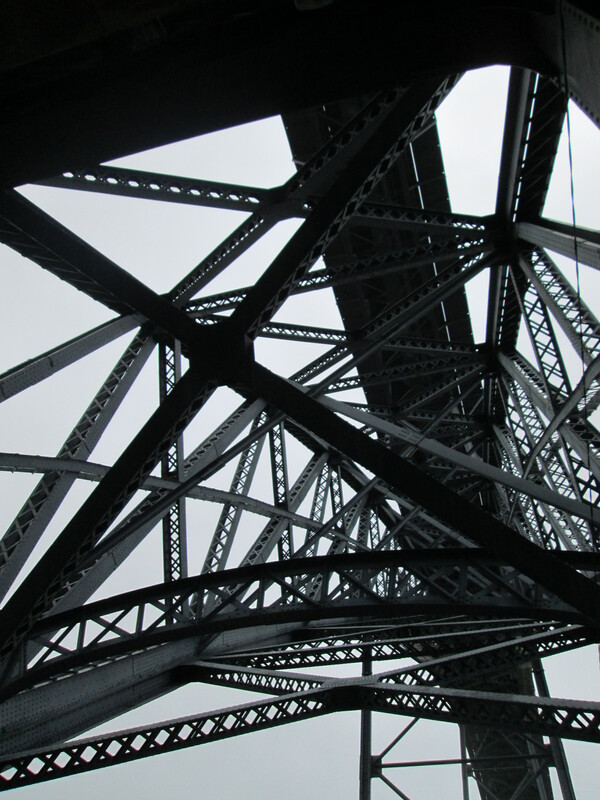 The employed artistic style and complexity of the structural stability were ahead of its time. 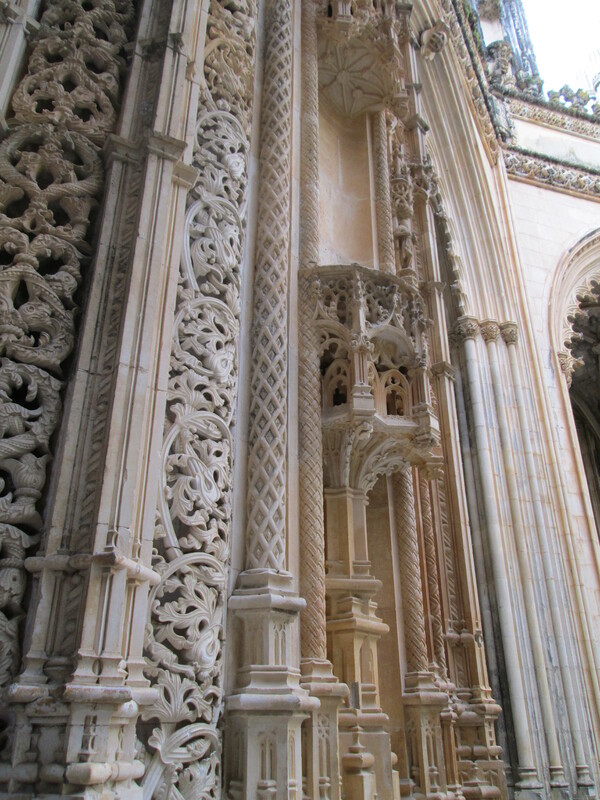 The majority of the structure is done in the Gothic Style, but gave way to the Manueline style in its final years of construction. I have used these expressions quite a few times in recent days, and even I don’t clearly understand the subtle differences between both. The following will be my attempt to illustrate the main features of each. 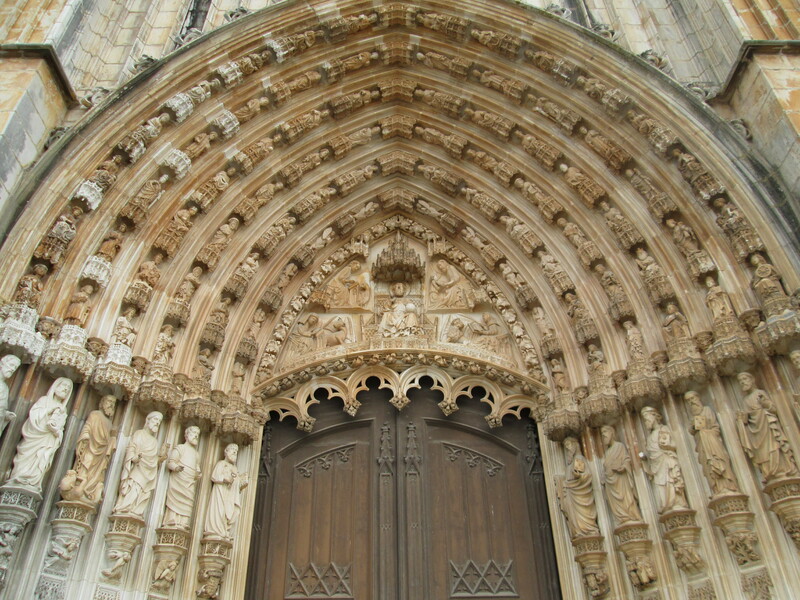 The gothic style is an evolution of the older Romanesque style and emphasizes the use of verticality and light. So classic buildings vie away from solid walls and embrace stone skeletons that involve clustered columns, ribbed vaults, and flying buttresses. A defining characteristic is a ogival arch. 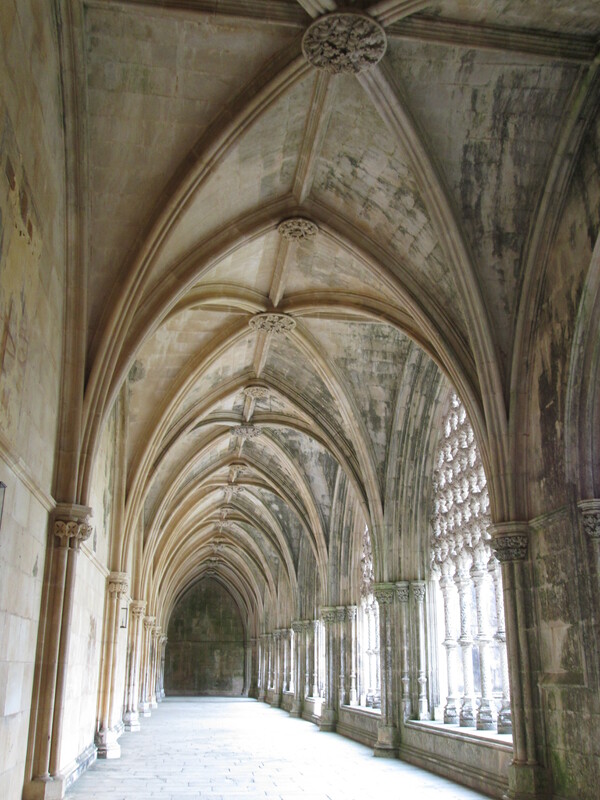 Structurally a pointed arch helped vault spaces that had irregular plans, or brought transverse vaults to the same height as diagonal vaults. 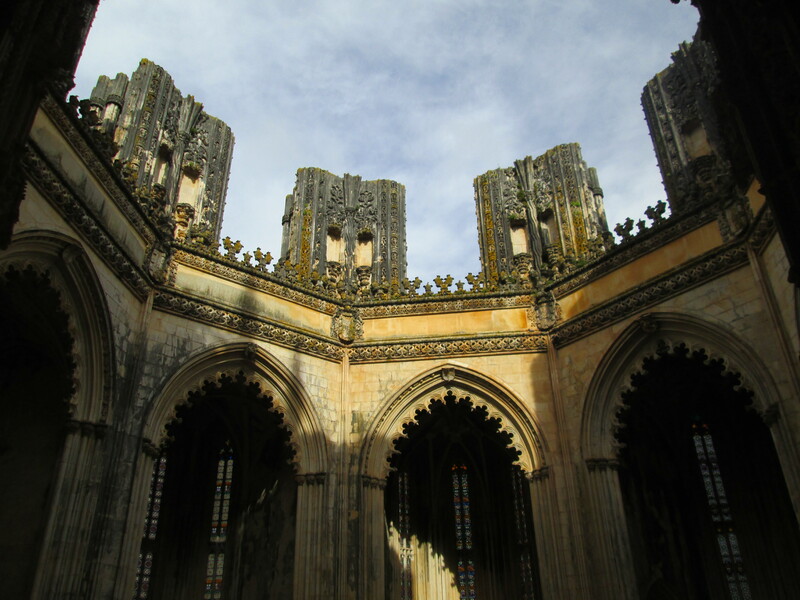 Additionally, gothic vaults tend to employ irregularly shaped polygons. This is advantageous because rather than being circular, orthogonal shapes provide clear load paths for the weight to distribute amongst the bearing pears and columns. Gothic churches also tend to be extremely tall; this verticality suggests an aspiration to heaven. This is emphasizes through the use of towers and spires projecting to the sky as seen on the exterior. 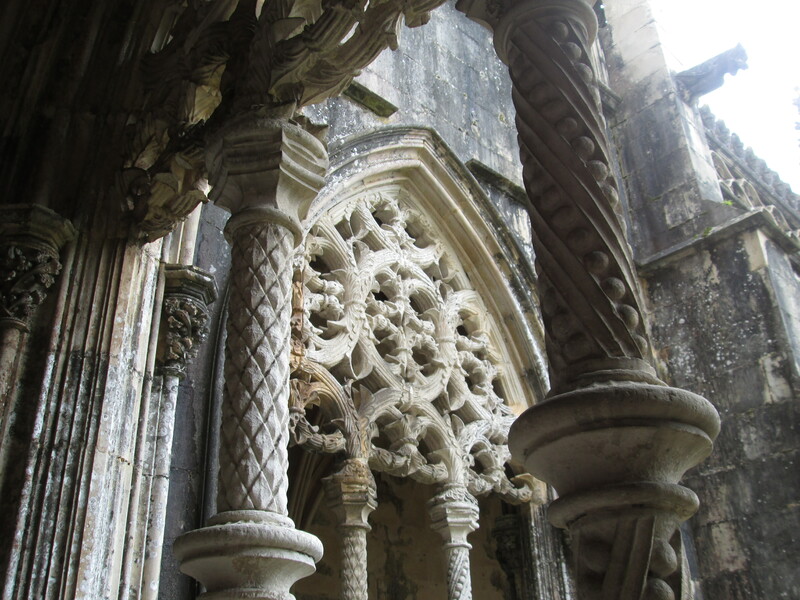 The Manueline style is also known as a Portugese late-gothic style is evident in many late medieval buildings. 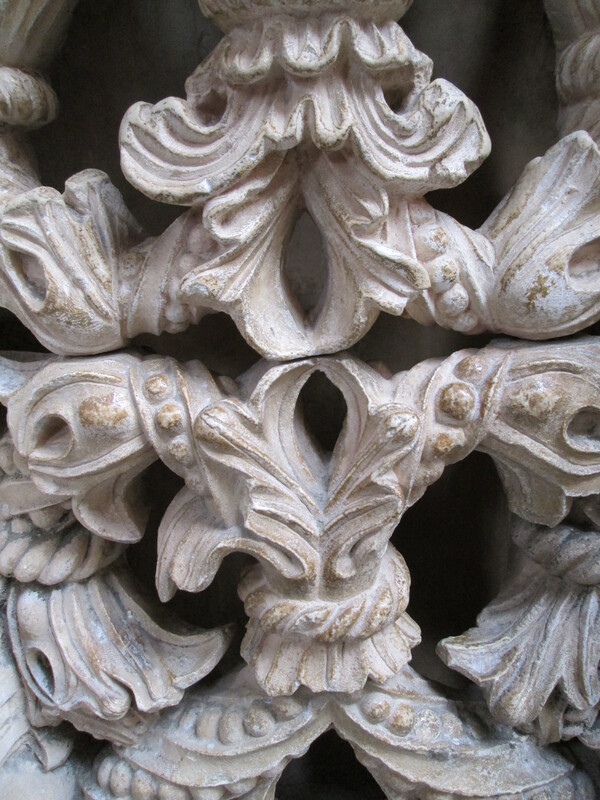 Classic elements include intricate stonework with incorporates ship elements such as spheres, anchors, and chains. It also embraces use of items from the sea such as sea shells, pearls, and strands of seaweed. Additionally, symbols of Christianity such as the cross of the Order of Christ are prominently features. botanical motifs also play a role. The discoveries of newly discovered lands can subtly seen as well. I woke up late. AGAIN. Hard to know whether it’s a result of terrible jet lag or sleep debt. My dear friend is surprisingly merciful (or not) in letting me sleep in. 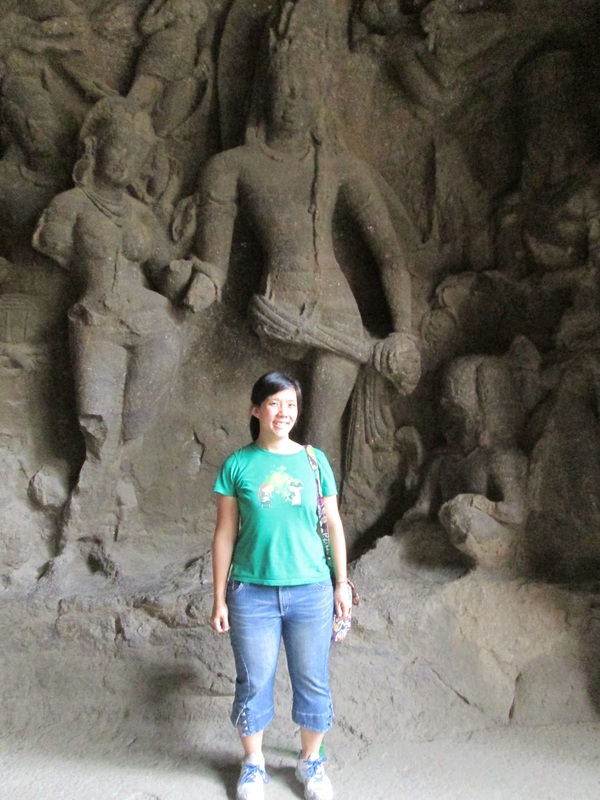 Nonetheless, we managed to fill today with a variety of sights, which range from natural and subterranean geologic formations to above ground man-made structures. Our first destination for the day, post-lunch (may I add) was the Cave of Coins (Grutas da Moedas); named as such due to the legend that robbers meant to dispose of the victim by tossing his body down the shaft, but accidentally left the coin pouch attached to his belt, it is said that the coins are still scattered about the cave. Two hunters chasing after a fox accidentally stumbled upon this cave in 1971. 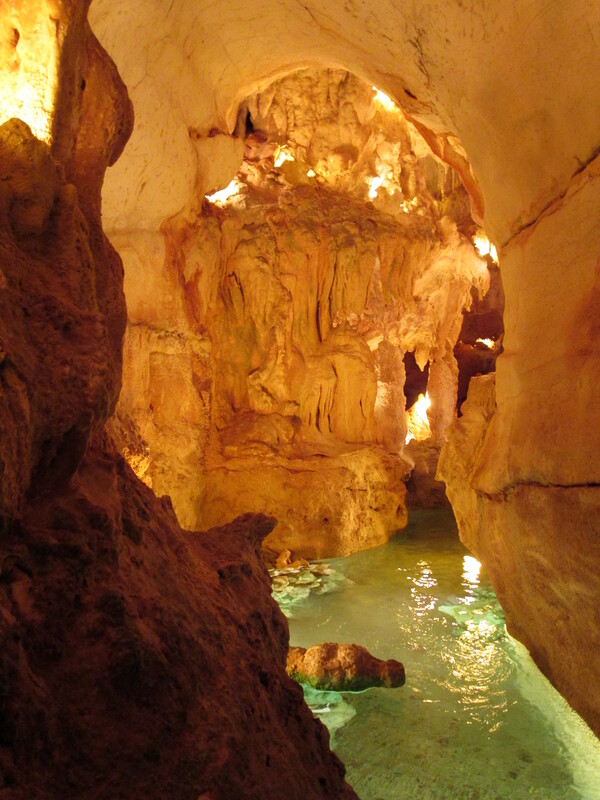 It runs about 45 m deep and dates from the mid Jurassic Period. Each room has a descriptive name that requires a sprinkling of imagination to understand how it received its title. 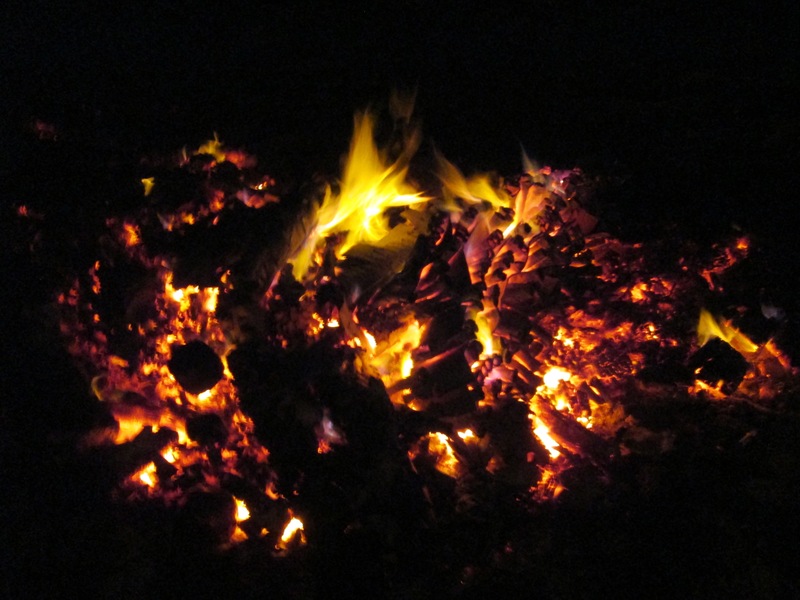 It is not hard to see the natural beauty that is hidden below ground. 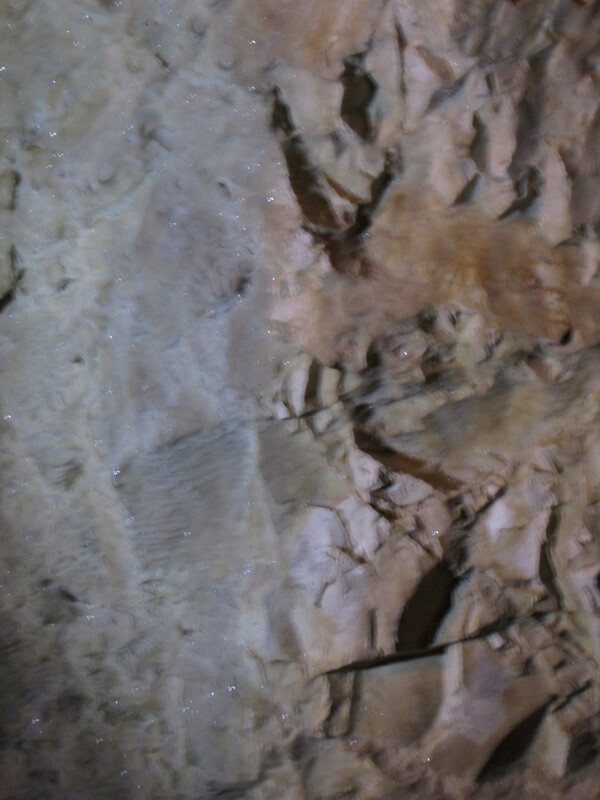 The motion of water blended with stone allowed for the progression of peaks downwards from the cavern top as well as upwards from the floor. 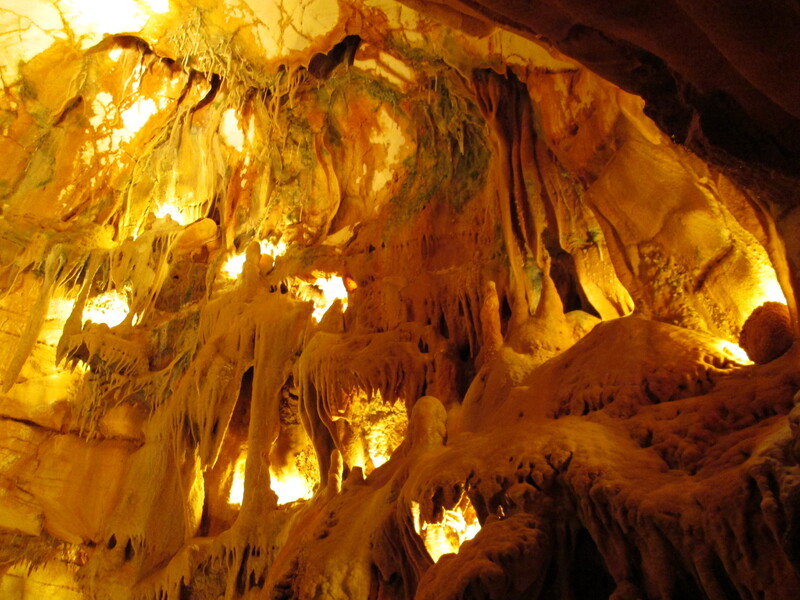 These are named stalactites and stalagmites respectively. 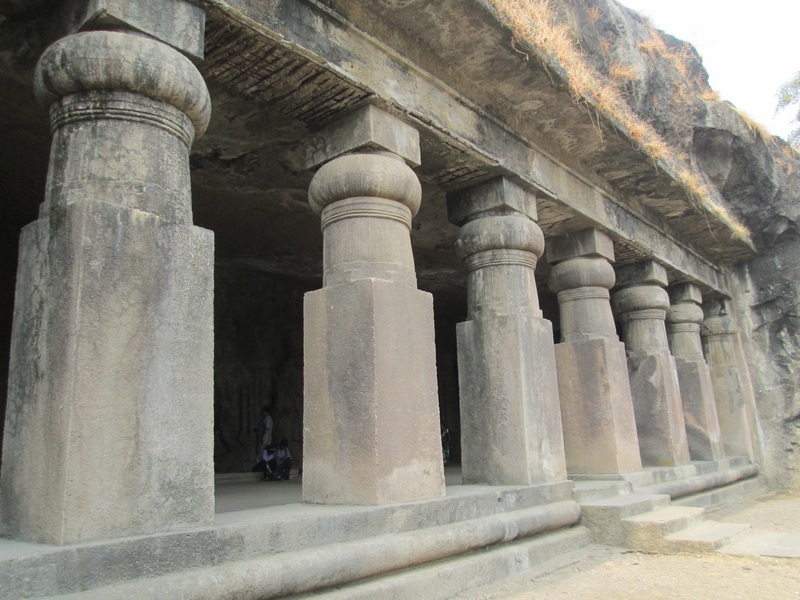 They extend a mere few inches every hundreds of years depending on the abundance of natural minerals within the caves. 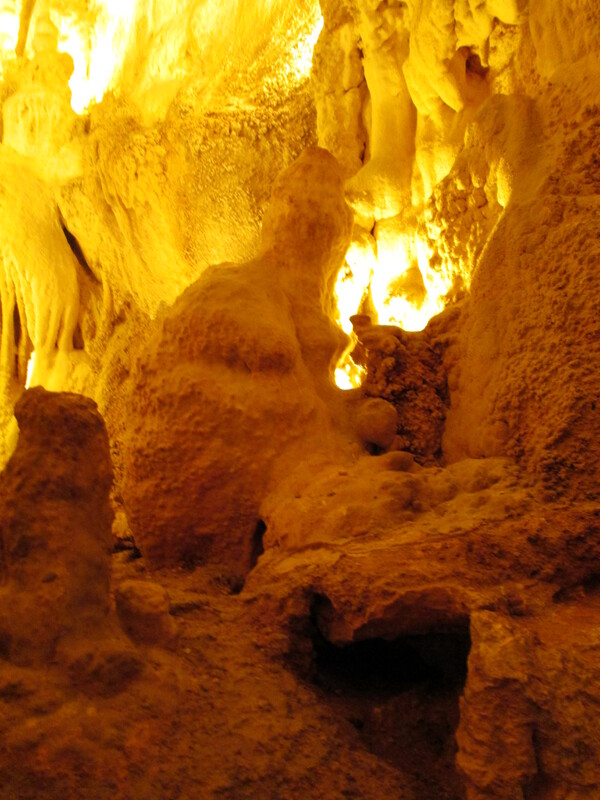 Occasionally, a stalactite and stalagmite will meet forming a column in the middle. 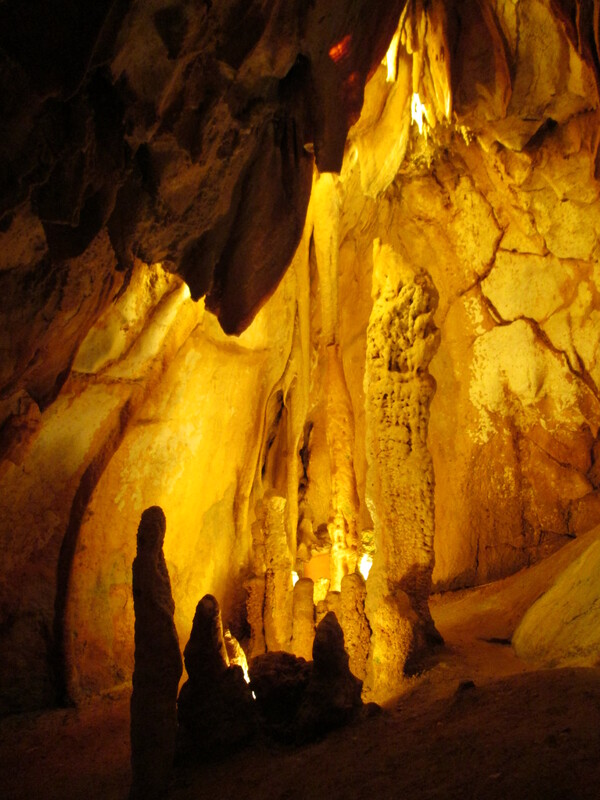 The Moeda caves have a secret; at the right location, a simple beam of light will show the shimmering crystalline surface on the rock face. 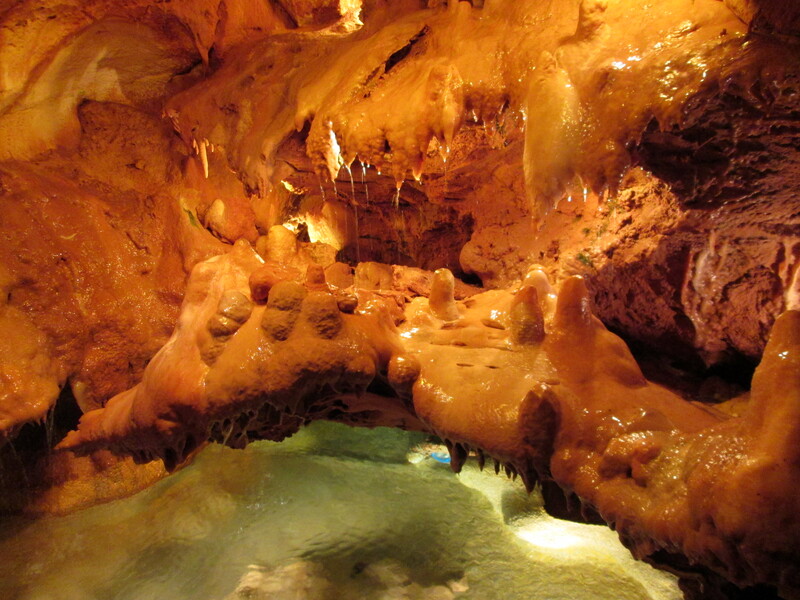 This requires just the right amount of minerals to be present, to allow for the calcite to form. The most enjoyable part of my visit was trying to understand what formation inspired the room’s title. What do you think these rooms were called?